Hard to tell without video enhancement, given the distance from the camera and the drizzle, but Douglas Barton may have been issued a court appearance ticket. It’s heartening to see authentic local law enforcement on Herkimer’s Pleasant Avenue. It’s coincident with the abrupt retirement of our Pleasant Avenue neighbor, Herkimer Police Chief Joseph Malone, outed by an ethics investigation. Only a year ago the Herkimer Police contented themselves with at best gently chiding the Bartons when they did something foul, sometimes even supporting their reign of terror of the street by attempting intimidation under the color of authority. Author Stephen Ames Berry is a former officer of Harvard University and a veteran of the National Security Agency’s US Army Security Agency. He lives in Pleasant Avenue’s historic Camera House. Below’s a clip of a conversation I had with Herkimer Fire Chief John Spanfelner on 6/14/16. The backdrop of it is the repeated illegal bonfires over past few months at 328 Pleasant Avenue, which is next to our own house at 330. 328 Pleasant Avenue is owned by Mrs. Harriett Tangorra, Clerk of the Herkimer Supreme Court, who unblushingly rents it to abusive thug and pyromaniac Curtis Cool, aka Curtis Dolan. Despite my emailed reports and videos of the fires over the last 6 weeks to Mayor Anthony Brindisi and Fire Chief Spanfelner, Herkimer officials have yet to take any action to protect our village neighborhood of close-set, tinder-dry 19th century homes from the threat posed by a deeply disturbed young man. A fast-moving nighttime fire could easily wipe out scores of houses and sleeping people. (Mr. Cool likes his fires late at night.) Only when I said I’d be advising my property insurance carrier that Herkimer was demonstrating misfeasance by failing to remedy a known threat to life and property did village authorities take a grudging interest. The only response to this ongoing threat was on 6/6, when Chief Spanfelner visited 328 Pleasant Avenue, 7 days after receiving my video clips and narrative of the most recent Cool blaze of 5/30. The chief concluded that there was no evidence of the fire, that my videos were of the wrong yard, gave the fire thug a copy of the village fire regulations and left. Following the chief’s feel-good visit, Cool celebrated on 6/11 by assailing my wife and I on the sidewalk, and then with a major illegal fireworks barrage on 6/13. Fire of 5/30/16 in yard of 328 Pleasant Ave. Note circle in top right behind fire, marking fence boundary with 326 Pleasant Ave. Written by Herkimer Post Crime Editor, author Stephen Ames Berry. Berry is a former officer of Harvard University and a veteran of the National Security Agency’s US Army Security Agency. Several days ago we mourned the loss of a small bird that may have nested in one of Curtis Cool’s trees. Yesterday we found the feathered remains of a downy baby bird and its mom. Yet again last night Curtis Cool (A/K/A Curtis Dolan) and his cronies enjoyed another loud and highly explosive fireworks display about 4 feet away from the house he rents from Harriet Tangorra at 328 Pleasant Ave.
Herkimer police and fire officials seem unable to convince Mr. Cool to cease his noisy, dangerous and illegal, fire-obsessed activities, ongoing now for 2 months. Perhaps they don’t really want to? We have shared our videos that stream automatically offsite with you, the public and with Herkimer Mayor Anthony Brindisi and Fire Chief John Spanfelner. They’ve left Herkimer’s population at risk by doing nothing to stop Mr. Cool from his illegally loud and incendiary backyard actions. In his first 1:00 AM backyard bonfire, Mr. Cool was assured by a policeman that such fires were OK and nearly patted on the back to alleviate the annoyance of their visit. Last night when we called police, all they did was drive down the street past his house. WOW! Why is it that both Herkimer Police and Herkimer Fire Department think it’s such a good idea to let Mr. Cool play with fire and break NY State law regarding maximum decibel levels and fire laws? They are teaching adults and children alike some bad lessons. Molesting animals with horrible noise – Not a Problem! Breaking the law (county, state and Federal)– Not a problem! Endangering neighbors’ lives and homes – Not a problem! Dear Herkimer Police and Fire Department, it’s your responsibility to uphold the laws of our country and community. It’s your responsibility not to embolden those who break them. Mr. Cool is loudly proclaiming that he can do whatever he pleases and you are letting him get away with it. This is a problem! Fireworks were involved in an estimated 10,500 injuries treated in U.S. hospital emergency departments during calendar year 2014 (95 percent confidence interval 7,700–13,300). An estimated 7,000 fireworks-related injuries (or 67 percent of the total estimated fireworks-related injuries in 2014) were treated in U.S. hospital emergency departments during the 1-month special study period between June 20, 2014 and July 20, 2014 (95 percent confidence interval 4,900–9,200). Four victims died in house fires caused by fireworks, including several where the person(s) killed may not have been using fireworks. Seven victims died from direct impacts of fireworks. Reporting of fireworks-related deaths for 2014 is not complete, and the number of deaths in 2014 should be considered a minimum. 328 Pleasant Avenue Herkimer is owned by Mrs. Harriett Tangorra, and sits among its close-packed, tinder-dry 19th and early 20th century neighbors. In the last five weeks it’s been the scene of three illegal fires, one in which the yard’s racist thugs assailed an elderly Jewish neighbor. (That would be my wife, blog hostess Linda) in an anti-Semitic and ageist tirade. And then there was their poor abused dog. Adjacent structures – 328 Pleasant Avenue fires site. Note plastic screen gazebo feet from fire source. That last were probably meant my wife, who they probably thought called the law on them. But no, we did not call the police, or the fire department, as we’d only just discovered their latest episode of pyromania while reviewing our last night’s surveillance footage. As their bonfires threaten both Pleasant Avenue and Eureka Avenue, someone else may just possibly have reported them–possibly several someones. Their only friends on this street are their fellow drug thugs. Chief Spanfelner then visited with Mrs. Tangorra’s tenant Curtis Cool (A/K/A Curtis Dolan) at neighboring 328 Pleasant Avenue. Watching him go, I felt relieved that someone was finally doing something to protect Pleasant Avenue from its resident fire thug. I was wrong. 6/24/16. Postscript. Chief Spanfelner had an equally cordial visit with fire thug Curtis Cool at 328 Pleasant Avenue, politely providing him with a copy of the Village of Herkimer fire ordinances. The chief confirmed this in a phone conversation with me, which would have to be heard to be believed. Embolden by the chief’s act of nonfeasance, Cool reacted as you might expect a criminal to act. More on this later. Author Stephen Ames Berry is The Herkimer Post’s Crime Editor. Berry is a former officer of Harvard University and a veteran of the National Security Agency’s US Army Security Agency. In this story you’ll discover how a malicious, well-executed kick transformed the acts of a neighbor recycling stuff on her own property into an act of larceny as defined by officer Haight of the Herkimer Police Department. On July 15th at approximately 9:21 PM, I was placing a few items in the recycle bin that I keep outside in my driveway here in the Village of Herkimer. As I was finishing up and about to return to the house, something struck the back of my legs. I turned around to find a soccer ball at my feet. I picked the ball up and approached my house. Nearby voices in the dark called for its return. As with many parents whose children do something they shouldn’t, I refused to hand the ball over. My driveway is very narrow and virtually inaccessible to normal ballplayers; the ball could only have entered it if had been kicked from across the street, not down it. It was obviously part of an ongoing and escalating pattern of harassment directed against my husband and I. Some neighbors strongly opposed our driveway security camera that records the stream of nighttime traffic. 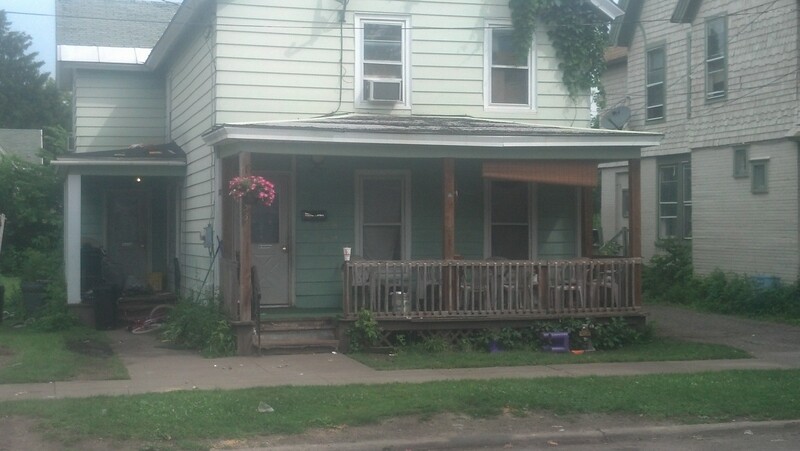 The Bartons of 333 Pleasant Avenue, who a regional DEA agent referred to in a phone conversation as “the porch people” were especially outraged by this camera presence. 1. At 9:24 PM., according to our video recording, Herkimer Village’s Officer Haight, appeared at our door. Officer Haight confessed ignorance of any of the multiple acts of vandalism, mob menacing and break-ins we’ve suffered over the past year, at least one orchestrated by the Bartons. I was thus accused of victimizing the Bartons by withholding their ball, which had just been used to assault me. Officer Haight demanded to know the ball’s location. My husband said it had migrated to an adjacent empty yard. Officer Haight’s supervisor then arrived and the two went off to fetch the ball for the Bartons, who were consumed with mirth as they lounged watching from their porch at 333 Pleasant Avenue. The Herkimer police officers respectfully returned the ball to the Bartons and departed – our harassers were treated with deference while we were disdained. 3. To avoid having neighbors continue to trespass on my property. I never play ball. I spend my time hiking, writing and mending the myriad of worn out portions of my dilapidated and ancient (yet adorable ) Herkimer Village home. In the past year due to neighbor trespass, break-ins and vandalism, we’ve had to expend resources on security systems and cameras, rather than on our home’s aging infrastructure. Police who aid and abet the victimization of peaceful retirees by neighbors who act criminally, and make ill-informed, self-serving and egregious statements, are at the very least in need of remedial training.